Show off your style with this beautiful piece from Pfister. Redo the look of your bathroom with this beautiful single-control faucet. This item's deck mounted design is easy to set up so you can enjoy a finished counter top. This WaterSense certified faucet saves water and money, but gives you the same clean. Update the look of your bathroom with this high-class, useful piece from Moen. Finish up your bathroom remodel with this beautiful single-control faucet. Its deck mounted design fits with many sinks and isn't hard to install. This faucet is WaterSense certified for less water use to give you the same clean. Add a modern look to any bathroom with this piece from Pfister. Give your bathroom a brand new look in no time with this single-control faucet. Its deck mounted design fits with many sinks and isn't hard to install. This faucet is also WaterSense certified to help you and the environment stay clean. This European-inspired faucet embodies all things old World. With its elegant yet sturdy neck and robust handles, the Hanover bathroom fixture appeals to anyone with a classic palate and a taste for the timeless. 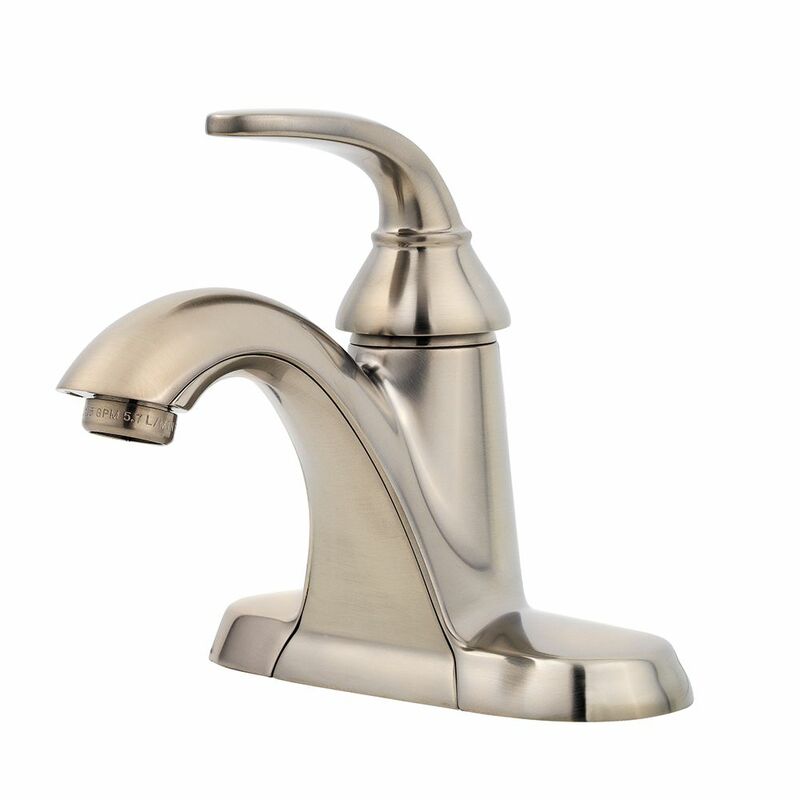 The Hanover faucet comes in a variety of finishes making it the perfect accessory for any traditional setting. Pasadena Single Hole 1-Handle Mid Arc Bathroom Faucet in Brushed Nickel with Lever Handle Show off your style with this beautiful piece from Pfister. Redo the look of your bathroom with this beautiful single-control faucet. This item's deck mounted design is easy to set up so you can enjoy a finished counter top. This WaterSense certified faucet saves water and money, but gives you the same clean. Pasadena Single Hole 1-Handle Mid Arc Bathroom Faucet in Brushed Nickel with Lever Handle is rated 4.4 out of 5 by 92. Rated 5 out of 5 by Dcmom from Easy to install..comes with drain. Beautiful and reasonably priced. ... Easy to install..comes with drain. Beautiful and reasonably priced. Rated 5 out of 5 by ssquared from Easy to install, especially with the conversion of the water line connections from threaded to cl... Easy to install, especially with the conversion of the water line connections from threaded to clipped quick connect. Removed hard job using wrenches far up the back of the sink. Long tail pipe on the drain makes shortening to length and connection to flexible joint easy. Faucet and drain designed well and seemingly sturdy. Home Depot made buy using a gift card easy. Rated 4 out of 5 by Jill from Our house was built in 1994, and trying to hook... Our house was built in 1994, and trying to hook up this new sink to our existing lines, was a nightmare. The sink is really nice, but not easy in an older home. Rated 4 out of 5 by George from Got this on sale. Well worth the price. Perfect... Got this on sale. Well worth the price. Perfect for my rental property. Good quality and good looking. Rated 5 out of 5 by Lola from it did not only because I need to get a... it did not only because I need to get a two handle instead of a one handle. Beautiful faucet. didn't realise I could not use the item until after the contractor left. I cant open my middle mirror because the handle is too tall. however he took box with him. so how do I return this item with out the box? Rated 5 out of 5 by pj from look good easy install ,great price.... look good easy install ,great price.